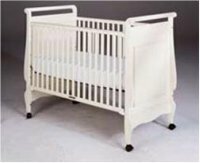 The U.S. Consumer Product Safety Commission in cooperation with Ethan Allen, of Danbury, Conn. have recalled about 3,250 drop-side cribs. The crib’s drop-side rail hardware can malfunction, detach or otherwise fail, causing part of the drop side rail to detach from the crib. When the drop-side rail partially detaches, it creates a space between the drop side and the crib mattress. An infant or toddler’s body can become entrapped in the space, which can lead to strangulation and/or suffocation. A child can also fall out of the crib. Drop-side incidents can also occur due to incorrect assembly and with age-related wear and tear. Ethan Allen has received five reports of incidents involving the crib’s drop-side detaching, resulting in bumps and bruises to three children. One child became entrapped and two children fell out of the crib after the drop side detached, one child received a pinched hand and one child received an unspecified injury. This recall involves Ethan Allen brand cribs with item numbers 14-5650, 15-5650, 16-5650, 26-5650, 35-5622, 36-5620, 36-5622 and 38-5622. 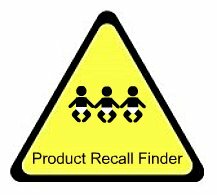 “Ethan Allen” and the item number are printed on a label on the crib’s headboard or footboard. The cribs were sold in a variety of colors. The cribs were sold at Ethan Allen stores from January 2002 through December 2008 for between $550 and $900.They were manufactured in United States and China. Consumers should immediately stop using the recalled drop-side cribs and contact any Ethan Allen store to receive a free repair kit that will immobilize the drop-side rail. In the meantime, parents are urged to find an alternate, safe sleeping environment for the child, such as a bassinet, play yard or toddler bed depending on the child’s age.